Leadership Development: I’m Not A Conversationalist! You’re a new leader in charge of a team. Maybe you’ve worked as a member of a team for months or even years and have been promoted to the leadership position. Maybe you were hired or transferred to this leadership position. For any sensible person, this is a bit terrifying because you now face new leadership development challenges, beginning with the way you communicate with the team. Let’s take a look at two examples of new leadership in action. 1. Sam worked as a member of a customer support team for five years before being promoted to team leader. He had a good professional relationship with everyone on the team: They could rely on him to get his tasks done and to help the others when needed. That was a big reason why he was put in charge. Yet, as he got ready to lead his first team planning session, he realized that his colleagues were now all looking at him in a different way. Their faces seemed expressionless, as if they were waiting for him to tell them how to feel. As he stared down the conference table at his team, he felt really nervous for the first time since joining the company. 2. Paula had been promoted to manager of a technical support team in a different division and had moved halfway across the country to take up the post. She had already reviewed the resumes of each of the team members. As she stared down the long conference table at her new team, she realized she knew nothing about any of them. Her stomach knotted up with nerves. Both of these new team leaders have a challenging task in front of them: Building a relationship with their team that promotes trust and confidence in each other and in their leadership. Paula is approaching a new team for the first time, entering an unknown landscape. And even though Sam has known his colleagues for years, he must now address them from the position of leader, and that changes the relationships he had with them. These days, it seems like the first thing a new leader has to do is to start building what I call vulnerability trust. Many try to do this by being conversational with each team member right away, asking casual questions or telling jokes. There’s nothing wrong with this approach; just realize that, while trust is an important component of an effective team, it isn’t going to magically appear in your first team meeting. In fact, vulnerability trust takes time to build and may be the last puzzle piece to snap into place for your team. Instead, refer back to the first chapters of my book (or the past entries in my blog) where I discuss the four stages of team matriculation: Forming, Storming, Norming and Performing. No matter what a leader’s existing relationship is with a team, you will have to take them through some variation of team matriculation stages. Doing so will confirm each member’s role in the team and help them become comfortable with the new dynamic and confident in you, the team leader. Let’s get back to our two new leaders. Likewise, Paula had her own realization, based on her own experiences as a team member. What employees wanted after a significant change, more than anything, was stability. And the best way to regain stability was to give her team a solid base to work from: that meant requirements and rules. 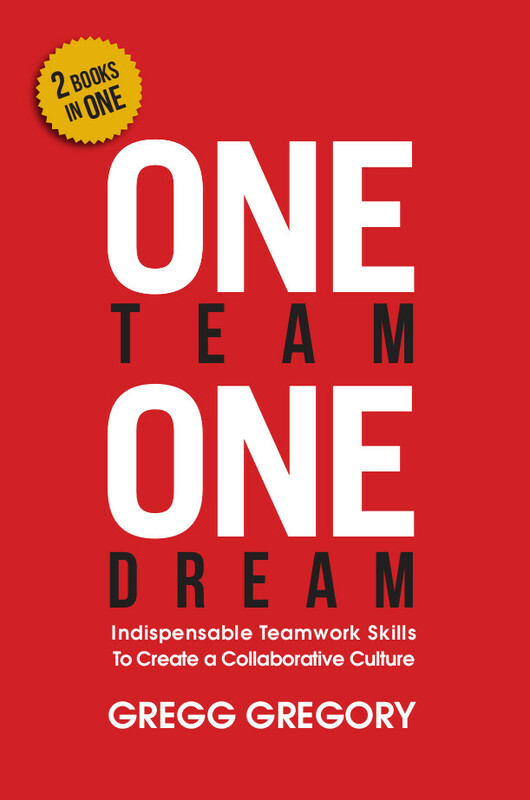 Excerpted from One Team, One Dream by Gregg Gregory For more information, get your copy of Gregg’s book, One Team, One Dream today! Available in both print and electronic versions! Bill Marriott talks about Gregg and his story on How One Person Can Impact An Entire Team.